1978 UCLA All-America Eliot Teltscher was ranked among the World’s top fifteen tennis stars from 1980-1984, reaching #6 in 1982. For seven of the 1980s’ first eight years, Teltscher was ranked among the United States’ Top Ten Singles players--his top spot #4 in 1984. As a Bruin undergrad in 1977 and 1978, Eliot held U.S. #23 and #26 (singles) rankings. In doubles, Eliot was U.S. #6 in 1979 (with Francisco Gonzalez); #4 in 1980 (with Terry Moor); and #8 in 1981 (Moor). 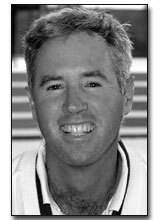 Eliot also holds three Junior titles: Age 16--1974 U.S. Indoor Doubles (with Clark Diehl); at 14--1973 U.S. Hardcourt Doubles (L. Gottfried); at 12--1971 Hardcourt Doubles (James Curley).